Published Feb. 10, 2018 at 6:05 p.m. In celebration of its approaching 50th, the Milwaukee Ballet announced the 2018-19 season with classic-and-contemporary selections and a creative collaboration with the ballet's neighbor, the Walker's Point Creative Collective. The 2018-19 season will include Michael Pink's Dracula, The Nutcracker, Genesis 2019, Lambarena, and Bruce Wells' A Midsummer Night's Dream. "We are always searching for new ways to build stronger relations with our audiences and with our community," says artistic director Michael Pink. "Working with the artists at Walker's Point Creative Collective is a unique collaboration and one I haven't seen before. Both of our artforms are low-tech in the way they are executed – through perseverance, passion and a little bit of physical discomfort." Milwaukee Ballet commissioned the Walker's Point Creative Collective to help announce the season via murals. Hence, the graffiti artists created murals in five locations throughout their neighborhood to represent each production in the upcoming season. 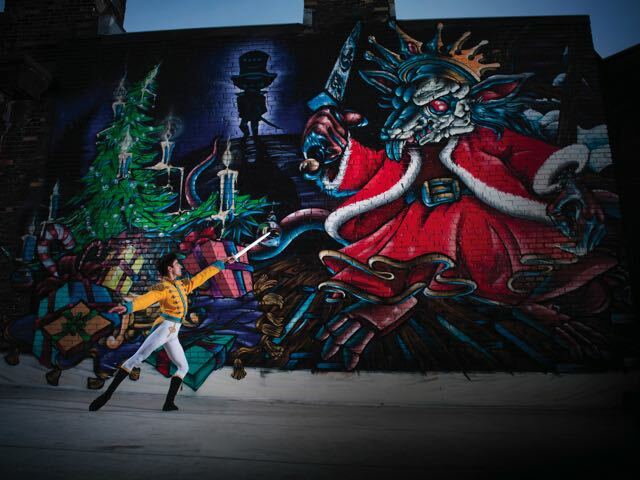 The Dracula mural is in an alley on 5th Street and National Avenue, The Nutcracker is atop the Bern Office Systems building on National Avenue, and Genesis, Lambarena and A Midsummer Night's Dream are inside the Coakley Brothers Building. 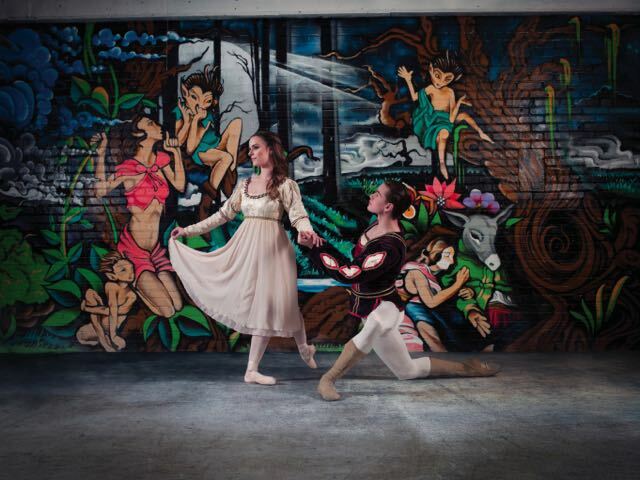 Photographer Tom Davenport captured images of Milwaukee Ballet dancers in front of the murals, under the art direction of Timothy O'Donnell, for the Milwaukee Ballet's 2018-19 season brochure. The Collective painted the murals between September and December of 2017, starting with the Dracula mural. Murals and other forms of public art have become increasingly common in the Walker's Point neighborhood, with new artistic additions like Selena, Welcome to Walker's Point, the Coakley rooftop art and even a Minion cropping up in the past year or two. Josh Ebert – sometimes known as "Joshy Bert" – is the founder of the Walker's Point Creative Collective. He is a tattoo artist at Walker's Point Tattoo Company and an artist in many media, predominantly spray painting and airbrushing. More than a dozen artists are connected to the collective. "(The mural project) is a way to raise another art form and to honor the neighborhood," says Anne Metcalfe, the ballet's marketing and communications director. "The ballet has been a long-standing member of the community and partnering with a newer neighborhood group was the perfect and unique way to represent a very exciting season. And it was a ton of fun." Photo: Tom Davenport. Dancers: Davit Hovhannisyan and Lizzie Tripp. Artwork: Chacho Lopez. Photo: Tom Davenport. Dancers: Marie Collins and Josiah Cook. Artwork: Jon Bartels. Photo: Tom Davenport. Dancer: Marize Fumero. Artwork: Mike Davenport and Josh Ebert. Photo: Tom Davenport. Dancer: Nicole Teague-Howell. Artwork: Josh Ebert and Antonio Gomez. Photo: Tom Davenport. Dancer: Barry Molina. Artwork: Andre Colbert, Julian Correa, Saul Hernandez, Chacho Lopez, Josh Rivera. Blood and beauty dance in the return of Milwaukee Ballet's brilliant "Dracula"
4 reasons you need to be at the Milwaukee Ballet's "La Boheme"